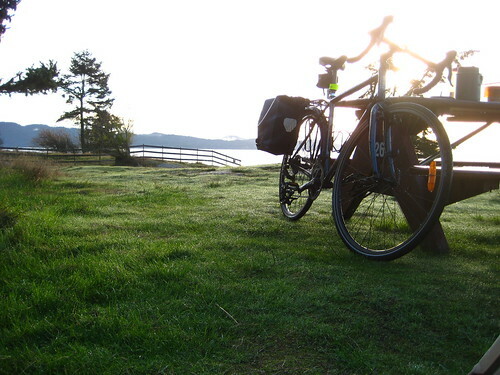 Had an unexpected couple of days off work and the weather was holding well for mid-October, so I decided I’d load up the bike and head off to Salt Spring Island for a one-night campout at Ruckle Provincial Park. It’s about 35km from where I live in Victoria out to Swartz Bay Ferry Terminal, but except for the initial leg through downtown Victoria you’re entirely on the Lochside trail the whole way out. Bikes even have their own entrance to the ferry terminal, with signs on the Lochside trail and the highway directing you. 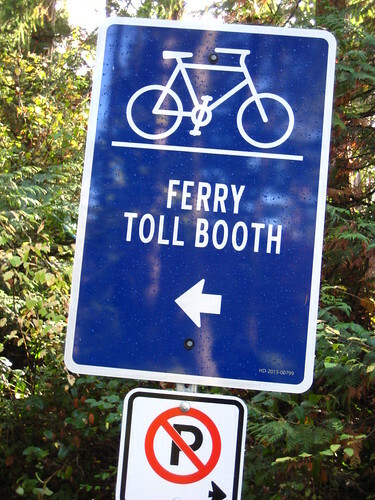 BC Ferries charges an extra $2 for a bike on top of the $11.90 per person fare; that’s round trip as you don’t have to pay again to get off any of the Gulf Islands! Fulford Harbour ferry landing to Ruckle Park is about 10km all told. Google Maps link here. 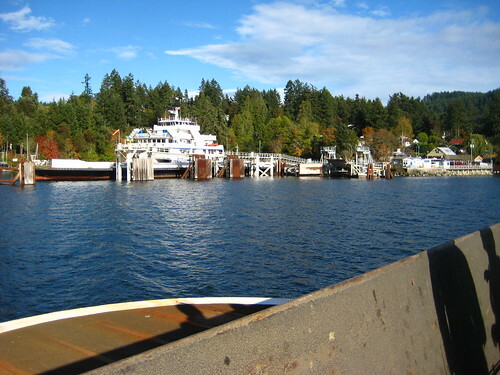 Even if you get off the ferry a bit ahead of the cars (bikes load and unload with the foot traffic on the Gulf Island ferries) I highly recommend spending a few minutes loitering near the ferry terminal so you aren’t jousting with impatient ferry traffic up the steep hill out of Fulford Harbour. I can recommend the Rock Salt Cafe right next to the ferry landing. You can get caffeine, chocolate, WiFi, and a plug to charge your phone there — that’s four of life’s necessities all taken care of! Speaking of phones, cell reception across Salt Spring is decidedly spotty, and even if you can get a bar or two of reception do not count on getting data service. It’s a hilly, rugged island and a lot of the locals aren’t too fond of the idea of a cell tower on every hilltop. If your navigation plan is “Google Maps/GPS on my phone” please do have an alternate, even if it’s just a quick sketch map! Ruckle Provincial Park out on Beaver Point is lovely and while it’s crowded in the summer, on a Monday in mid-October there were (according to the park operator who took my $18 site fee) exactly three sites in use. I had my pick of sites right up from the shoreline, with spectacular 180+ degree views of the other islands and passing ferries. No showers or flush toilets, but lots of drinking water taps around the campsite. 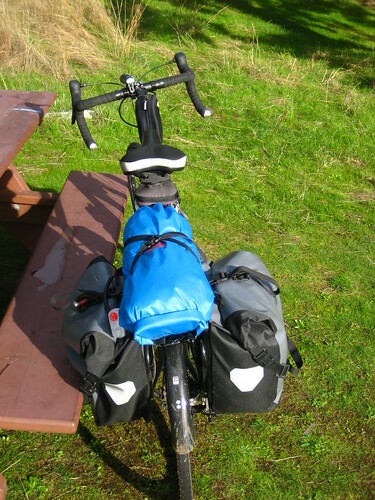 I had nice dry weather on the hilly 10km ride from the ferry to Ruckle, which took about an hour with a moderately loaded touring bike. Island roads are universally narrow and lacking shoulders, but the few drivers I encountered were all courteous enough. If you’re doing this in mid-summer, your milage may vary, as the saying goes. Ruckle Park is named after the Ruckle family, who have farmed the land since the opening years of the 20th C. They deeded the land to the provincial government as a park but still operate part of it as a working farm and orchard. 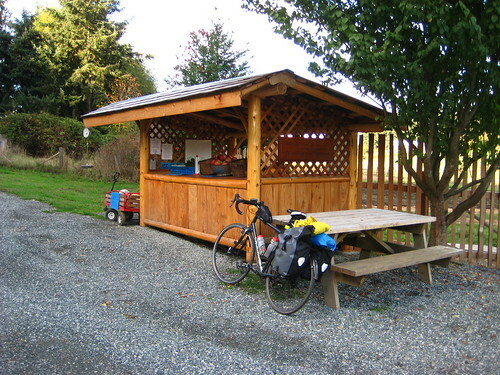 Their apples are delicious, and if I could have somehow carried one of their squash home on the bike I would have — their farm stand is well worth a stop. It rained on me a bit as it got dark around eight PM, so I retired to my tent to read a bit before going to sleep early. The next morning was sunny and clear initially; this was the view from my tent door when I woke up! I took my time with breakfast and multiple cups of tea, taking advantage of the October sunshine both for myself and to let the dew-wet tent dry a bit before I packed it away again. Checkout time at the campground is nominally ten AM but nobody showed up to fuss when I didn’t roll out until just before eleven. I headed over to a relative’s house for lunch, then went back to Fulford Harbour in time for the 2:50 PM ferry back to Swartz Bay, arriving in plenty of time for another coffee, chocolate, WiFi and recharging point does at Salt Fish! The ride back to Victoria from Swartz Bay to Victoria was routine but using Lochside Trail is always a pleasure; I stopped in Sidney for a quick early dinner and did get rained on pretty hard for about twenty minutes of the ride home to town, but other than that the weather had held up remarkably well for mid-October for this adventure. I’ll be back on Salt Spring again, I’m sure. 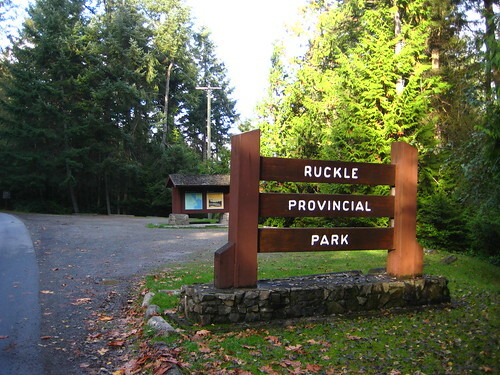 Ruckle is a lovely campsite and an easy ride out from Victoria, provided you’re OK with Salt Spring’s narrow and hilly roads. The whole album of photos from this little adventure can be found over on my Flickr account.